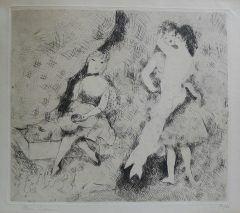 Marie Laurencin, French painter, printmaker and illustrator, was born in Paris, where she lived much of her life. At 18, she studied porcelain painting in Sèvres. On her return to Paris she continued her art education at the Académie Humbert, where she changed her focus to oil painting. 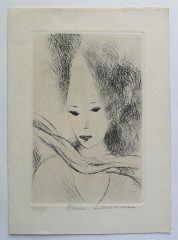 She had early success and was an important figure in the Parisian avant-garde. She was a member of both the circle of Pablo Picasso and the Cubists, exhibiting with them at the Salon des Indépendants and the Salon d’ Automne.